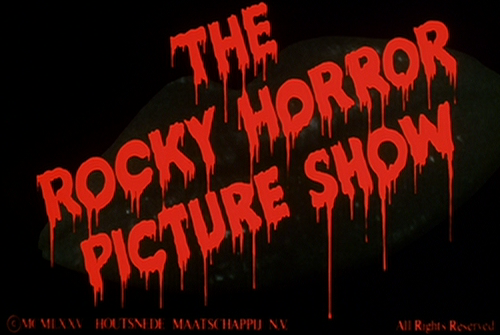 The Rocky Horror Picture Show (1975) is the film adaptation of Richard O'Brien's stage play, The Rocky Horror Show. It's also the reason for the existence of this web site and countless others, due to the massive worldwide cult following and audience participation phenomenon that its midnight showings somehow created. The film premiered in London on August 14th, 1975, had its U.S. premiere in Hollywood on September 26th, 1975, and... was a huge flop. It was not until April 2nd, 1976 that it began its midnight run first at the Waverly Theatre in New York City, then at the Riverside Twin in Austin, and so on. The movie found its audience as a midnighter and has been playing continuously for over thirty years now, with U.S. gross receipts of $150 million (and counting) despite never playing in more than a couple hundred theaters at once. Celluloid Jam - This LiveJournal community presents one DVD screen capture from The Rocky Horror Picture Show a day, with rare still photos posted weekly on Mondays by Larry Viezel. RHPS FAQ - Maintained by Ruth Fink-Winter. TimeWarp - Official U.K. Rocky Horror Fan Club. Spicks and Specks (2008-07-16) - 1 minute 9 seconds (636x344, 25 fps, 7.7 MB). "Nell, a lot of people would know you as Little Nell." "I grew." Guest panelist Nell Campbell is introduced on ABC's "Spicks and Specks" in Australia, a music-themed television quiz show. They talk about how she was originally cast for the part of Columbia in The Rocky Horror Show, and show a clip of her tapdancing during Time Warp in The Rocky Horror Picture Show. Originally aired on July 16th, 2008. Janet Is Cheap by Anonymous - 8:40, 232 kbps MP3, 14.4 MB (46.4 MB lossless FLAC also available). A 1980s era remix using numerous dialogue samples from The Rocky Horror Picture Show. Contributed by Jochen B. Check Up On The Time Warp () by DJ Clive$ter - 3:49, 192 kbps MP3, 5.3 MB. A mash-up by DJ Clive$ter of Beyoncé "Check On It" (featuring Slim Thug) with Time Warp from the Rocky Horror Picture Show soundtrack. Provided by Mashup Industries. Rocky Horror (The Anticipation/Participation Megamix) by Sisters In Stockings - 7:14, 235 kbps MP3, 12.2 MB. A mega mix of songs from the Rocky Horror Picture Show soundtrack and Audience Par-tic-i-pation album. Originally released in 1991 by DMC.